From fairytale Czech towns to Budapest, the Pearl of the Danube, experience the unique culture, food, and history of Eastern Europe. 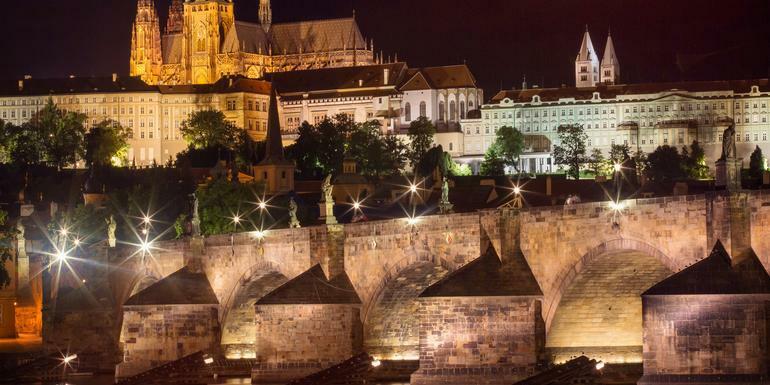 This two-week trip through six Eastern European countries offers an intriguing combination of urban centres, village life, and outdoor pursuits. Visit castles, churches, and romantic town squares, indulging in Berlin’s café culture and Prague’s beer. Opt to visit Rynek Główny - Europe’s largest medieval market square; savour a traditional Polish breakfast (kielbasa, yum), or sit back with a coffee and a slice of Poland's famous cheesecake (sernik babci) at one of the many cafes in the area. Then, walk it off with a stroll uphill to marvel at the impressive Wawel Royal Castle. Wander the elegant streets a little more, take in some of Europe's most distinguished art galleries or just settle yourself on a café terrace, order up a slice of mouthwatering Viennese cake and watch the world go by over coffee. Spend a free day exploring this charming and historic city. Opt to take a boat trip down the Danube, or travel further afield to the Etyek wine country. We recommend staying an extra night or two to experience all this city has to offer. 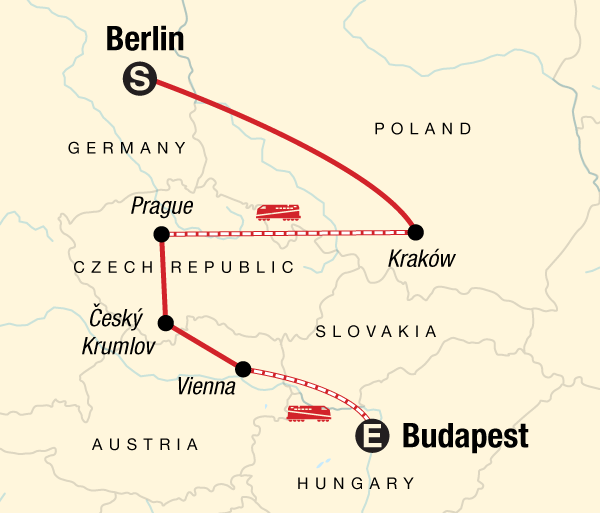 Only ground transport Train, long-distance bus, local bus, walking Intercity transport on this trip will be by local bus, and long-distance train and bus. The bus and train systems in Central Europe are generally good, but inevitably travelling by public transport can involve delays and frustrations, and we ask you to keep this in mind. This tour includes some long travel days, but we believe those hours of travel are more than worth it for the reward of seeing so much of this breathtaking region in a short space of time, so unfold your map, pack in your mp3 player and your phrase-book and get ready to enjoy some beautiful landscapes with your Polish or Slovakian neighbour. Between transport and hotels you may be required to carry your luggage short distances (up to 20 mins walk). It is important to note that accommodation in Europe tend to be quite different to other areas of the world you may have travelled in. Buildings and rooms are generally old and may not have been renovated or maintained to the highest standard. Downtown hotels in Europe were not build to be hotels but rich owners houses, which have been changed into hotels. Therefore unusual room sizes are common as large rooms have been partitioned in the past, resulting in rather "thin" walls. Reception areas, rooms and bathrooms tend to be very small as they were often added into an existing room, and may have a hand nozzle rather than a conventional shower head. On this trip you can expect to stay in small family-run hotels or pensions (with the exception of the start and finish hotels, which are often larger city hotels), which will vary a little in standard and facilities: some may not have elevators, air-conditioning or English-speaking staff, but most importantly all are locally-run, with some traditional character, and in excellent central locations to give you maximum time for exploring the sights. You can expect to find clean, safe, simple accommodation in convenient locations. Staff can occasionally demonstrate less than perfect customer service. As accommodation is in short supply, especially during the summer months, hotels can charge a premium and there is sometimes little motivation to improve facilities. Our accommodation in Krakow is a comfortable and modern hostel with double, twin or triple rooms, bathroom facilities may be shared. Rooms may be triple-share and are not all ensuite. However, the location and the homely welcome are unbeatable! Guides Chief Experience Officer (CEO) throughout, local guide in Auschwitz. 1. CLIMATE Weather in all countries visited is similar in May – October period. Summer is warm but rainy with 8 – 9 hours of sunshine. 2. YOUR CEO It is important to note that in Europe, all guiding is based around local guides all of whom are licensed to work only in a particular city. As such, our leaders are able to provide orientation walks which will show you the layout of each town and city as well as the location of local services such as post offices and laundromats, but are unable to legally share historical facts and figures in public places. Your CEO will be able to help you find a local guided tour in each location if you would like one. 3. LUGGAGE In Europe it is very rare to find elevators in train stations, hotels or other public places. We use public transport on this trip, which means you will need to carry your luggage from platform to platform, in and out of trains and buses etc. and also possibly up several flights of stairs. You will also need to be able to stow your luggage safely on trains and buses. It is therefore essential that you pack light and bring luggage which is compact and lightweight, and which you can easily transport. The carrying of your luggage remains your responsibility at all times. 4. COMBO TRIP Please note that this tour combines with other G Adventures tours. As such, the staff and some travel companions on your tour may have previously been traveling together with G Adventures, prior to Day 1 of your tour. Likewise, some staff and travel companions may be continuing together on another G Adventures tour, after your trip concludes.